Beijing's response was swift: development of domestic polysilicon supplies was declared a national priority. Money poured in to manufacturers from state-owned companies and banks; local governments expedited approvals for new plants. In the West, polysilicon plants take years to build, requiring lengthy approvals. Mr. Zhu, an entrepreneur who raised $1 billion for a plant, started production within 15 months. In just a few years, he created one of the world's biggest polysilicon makers, GCL-Poly Energy Holding Ltd. China's sovereign-wealth fund bought 20 percent of GCL-Poly for $710 million. Today, China makes about a quarter of the world's polysilicon and controls roughly half the global market for finished solar-power equipment. In an example cited by the EU Chamber study, wind turbine manufacturers face rules requiring that 70 percent of wind farm equipment had to be made locally---a requirement some local governments interpreted so strictly that Chinese manufacturers from other provinces were sometimes excluded. Though Beijing scratched the requirement last year, some local governments seemingly continued to apply it, the study said. The study doesn't name names. But Denmark's Vestas Wind Systems A/S, the world's biggest maker of wind turbines has had trouble elbowing aside Chinese competitors in China and increasingly faces them abroad. "It seems we are never 'domestic' enough," the study cited a wind power manufacturing executive as saying. Before Hu Jintao visited the United States in 2010, China promised to not favor domestic companies in “innovation” contracts. China’s wind power generating capacity has doubled annually for four years and in 2010 IT became yet another field in which China surpassed the U.S. to become number one. According to the Global Wind Energy Council China ranked first in wind power installations in 2010, creating 16,500,000 kilowatts of renewable energy compared to 221,000 kilowatts for No. 18 Japan. But wind still accounts for just 2 percent of China’s electricity capacity---and only 1 percent of actual output, because the wind does not blow all the time. As of 2007 China ranked fifth in the world in the annual instillation of windmills behind the United States, Germany, India and Spain. Rapid growth helped China make a leap to second place in 2008. In 2007 China added 1,300 megawatts of wind power, the equivalent of two average-size nuclear power plants. Total wind power production in 2007 was 2.6 gigawatts, still less than 1 percent of total energy use. Countries with most wind-energy capacity per capita (megawatts in 2008): 1) Denmark (581.6); 2) Spain (414.2); 3) Germany (290.1); 4) Portugal (268); 5) United States (83.6); 6) Italy (64.3); 7) France (53.4); 8) Britain (53.3); 9) China (9.2); 10) India (8.5); Rest of World (4.7). Wind farms have been set up in Guangdong, Fujian and Hebei Xinjiang and Inner Mongolia, where strong consistent winds blow across coastal areas, the deserts and steppes. China is building one of the world’s largest offshore wind farms, with wind turbines with 80-meter-long blades that generate 1.2 megawatts of electricity, enough to power hundreds of homes, at Huangha in the northern coastal province of Hebei. The plant is expected to cost $1.1 billion and produce 1 million kilowatts and is expected to be completed in 2020. There are plans for a similar plant on the southern island of Nano to provide energy for Guangdong Province. The Japanese firm Kyushu Electric is planning to build a $100 million, 200,000-kilowatt wind farm in Inner Mongolia with the Chinese power company China Huandian. China spenT $5.8 billion to more than triple its wind power capacity between 2007 and 2010 to 8,000 megawatts. . Greenpeace has estimated China’s wind power potential to be 1 million megawatts, more than twice China’s current total power-generating capacity of 440,700 megawatts. In November 2009, Chinese banks said they would invest $15 billion in a 14,569-hectare wind farm in Texas, which will produce enough energy for 180,000 American households. A report in Science magazine contends that the Chinese could increase the country’s current output by a factor of 16 from wind-generated electricity. A single wind-generating complex in Gansu Province in northwestern China will, when completed, has 38,000 megawatts of generating capacity, enough to supply the total electricity needs of entire countries like Poland and Egypt. Wind power infrastructure is lagging behind turbine construction. Already there are transmission bottlenecks and many wind turbines stand idle waiting for new transmission lines and connections to main power grids. China became the world’s largest maker of wind turbines in 2009, and is currently expanding its lead at a rapid pace. In 2009, China had three turbine makers---Xiungiang Gold wind Science & Technology, Confand Electric and Sinovel Wind--- in the top 10 in terms of sales by megawatts, according to the Danish think tank BTM Consult APS. 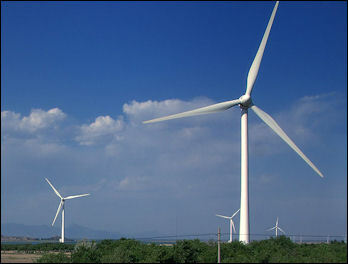 Other major wind companies in China include Dongfang Electric. Because the market in China is huge,Sinovel and Dongfang are among the largest win firms in the world even though they have few foreign sales. 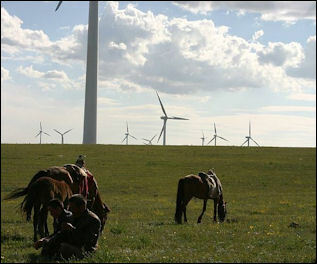 Together Sinovel, Dongfang and Goldwind sold one in eight wind turbines sold world wide in 2008. According to BTM, Vestal was the leader with 19.8 percent and GE was second with 18.6 percent. Vestas of Denmark has just erected the world’s biggest wind turbine manufacturing complex here in northeastern China, and transferred the technology to build the latest electronic controls and generators. You have to move fast with the market, said Jens Tommerup, the president of Vestas China. Nobody has ever seen such fast development in a wind market. China’s Goldwind Science & Technology is one of the world’s largest makers of wind turbines but it is virtually unknown outside of China and almost all of its sales are domestic as of 2009. But the company expects to change that really soon. Goldwind founded by Wu Gang, who was born in 1958 in Xinjiang, home to ferocious winds created vast plains and peaks and great extremes in temperature. There have been winds strong enough to blow trains from their tracks. Engineers from Europe have been testing wind turbines since the early 1990s. Wu was born and raised in the far-western region of Xinjiang, home to vast plains and peaks that create natural wind tunnels, with gusts so ferocious that they can sweep trains from their tracks. In the nineteen-eighties, engineers from Europe began arriving in Xinjiang, in order to test their wind turbines. 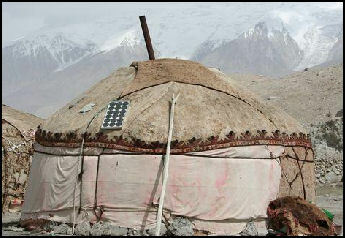 Solar power in Xinjiang China is the world’s largest manufacturer of solar panels. Chinese companies have a 30 percent cost advantage over European firms in producing solar technology according to Goldman Sachs. Still China lags behind Europe. the U.S. and Jaoan in terms of instillation. Even if China triples its instillation of solar cells in 2010 it will trail behind Germany, Italy, United States and Japan . The Chinese government has said it will pay up to 70 percent of the cost for new solar power systems. The aim is boost China’s solar industry. In Kunming and other places people are installing solar water heaters on the roofs of their homes and apartments, negating the need to burn coal for electricity and heating water. 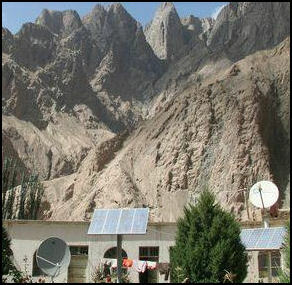 Army outposts have installed solar panels to provide electricity and heat offices and barracks. The energy is especially appreciated in remote border outposts. Solar has helped cut coal consumption by 127,000 tons a year in Tibet. In September 2009, the U.S. firm First Solar announced it was going to build the world’s largest solar plant in Ordos, Inner Mongolia. The plant is expected to produce 2-gigawatts of power, enough to power about 3 million Chinese households. Solar-powered yurt Models produced by Dezhou-based China Himi Solar Energy Group cost between $190 and $2,250 and work even when temperatures are below zero and the skies are filled with clouds or smog. Unlike solar panels that use expensive technology to produce electricity the solar water heaters consist of a row of sunlight-capturing glass pipes angled below an insulated water tank. Sunlight travels freely through the glass, generating heat that is trapped in a central pipe where the heat is transmitted to water. The secret to operating in cold temperature is the vacuum separating the inner tube with its energy-trapping coating from an outer tube. In Rizhao, a seaside city in Shandong Province with 2.8 million people, 99 percent of the households use solar water heaters. The devices used there have improved so much over the years some don’t need direct sunlight and function on cloudy or smoggy days. Advanced models have electrical water heaters that switch on during frigid cold days. The heating of water typically accounts for a quarter of the energy used in a building. The use of water heaters is so high in Rizhao because the local government there requires solar water heaters to be installed in all homes and subsidizes their cost. For many families that installed the devices it was the first time they ever had reliable hot water. In Dezhou, another city known for energy conservation, 90 percent of the household and streets are lit with solar-powered lights. The solar water heater market in China is very competitive. More than 5,000 companies manufacture water heaters there. The president of Gold Giant, one of 150 manufacturers in Rishao, told the Los Angeles Times, “The market is huge but the competition is fearsome.” Another water heater maker has had success with the slogan that his water heater will “take the feathers off a chicken.” The largest in China, Himin Solar Energy Group, got a $50 million investment from Goldman Sachs. Some are looking for export market abroad. The American market, where people use an average of 400 liters of water daily, will be difficult to crack because the heaters don’t heat that much water. Suntech solar panels The solar energy industry is fragmented but quite large. It employs 250,000 people, about an eight of all those employed in China’s renewable energy industry. Seven of the planet's top 10 solar panel makers are now Chinese. China is the world’s largest manufacturer of solar panels. Chinese companies had a 30 percent cost advantage over European firms in producing solar technology according to Goldman Sachs. China’s share of the solar module industry grew from 7 percent in 2005 to 25 percent in 2009. China has access to the rare earth neodymium, a critical ingredient in wind turbine magnets, and a large supply of cheap labor. When the California Solar Initiative started un 2007 only 2 percent of the model were Chinese. In the first quarter of 2009 he figure was 46 percent according to New Energy Finance. the state-rim China Development Bank agreed in 2010 to lend as much as $17 billion to Yingli, Suntech and Trina for development. Not only are Chinese solar companies doing well in their own right. Many foreign companies are outsourcing production to China. Marc Pinto of Applied technology told The Economist half the world’s production capacity is already in China, with two thirds of growth in capacity in 2010 expected to be in China. Yingli Solar was launched in the late 1990s. It is expect to ship a gigawatts with of solar cells in 2010. Yingli Solar, which only began making solar cells in the early 2000s, expects to ell more than a gigawatts. Analysts at Goldman Sachs singled out ReneSola, formally based in the British Virgin Islands but with all its manufacturing operations in China, as an attractive investment. Renesola aquired rival JC Solar in 2009 and has been ramping up its annual polysilicon production capacity, which is expected to reach 2,900 tons by the end of 2010 compared to 400 to 500 tons in 2009. Solar electricity provided by technology sold by the Chinese company SunOasis costs $0.25 per kilowatt hour, compared to $0.0375 to $0.05 per kilowatt hour for power from a coal-fired plant and $0.0125 to $0.025 per kilowatt hour for power from a hydroelectric dam. SunOasis is working with Shell to bring light to 80,000 peasant families as part of a $300 million project and develops solar power bug zappers. Suntech Power Holdings, makes silicon photovoltaic solar cells. It was valued at $9 billion in 2007, up 300 percent from its public stock offering in December 2005. Suntech is owned by Shi Zhengrong, listed as the seventh richest man in China on the Forbes list in 2006, with a fortune estimated at $1.43 billion. Shi founded Suntech in Wuxwi near Shanghai in 1992 after earning a Ph.D. in engineering in Australia. By coming up with and developing, in the words of the Wall Street Journal, “first world technology at developing world prices,” he quickly forged Suntech into one of the top four solar cell manufacturers in the world along with Sharp and Kyocera in Japan and BP. Shi told the New York Times he owes his success to Chinese provincial government subsidies and his reliance on low-tech labor rather than high tech machines to make his cells. Suntech cell produce energy at about $4 per watt. The goal is to reach $2 per watt by 2015. Roughly 90 percent of the company’s business is abroad but as prices come down he is ready to expand quickly in China. Huang Ming, boss of the company, is known to many as the "sun king," but he said, "I prefer to be called solar madman." "Renewable energy doesn't mean people have to be uncomfortable," Huang told the Washington Post in an interview at his Dezhou corporate headquarters, the Sun-Moon Mansion, a fanlike structure studded with photovoltaic cells and sun-collecting vacuum tubes. Andrew Higgins wrote in Washington Post: “Huang, an oil industry engineer turned solar energy tycoon, is driving one of China's boldest efforts to promote, and profit from, green technology. A member of China's parliament, he first started tinkering with solar water heaters in the early 1990s after the birth of his daughter, which he said got him thinking about the environment. At the time, he was working in a petroleum research institute and "felt guilty." He later quit the institute and set up his own company. He said he realized that clean energy would work only if the profit motive kicked in: "If it can't make money, this experiment will be a big failure." "This is real," Chiel Boonstra, a Dutch architect told the Washington Post. He heads the International Solar Cities Congress, a grouping of scientists and policymakers that champions low-carbon living. Dezhou, he said, "will be a new center of gravity for renewable technologies." Also impressed is Goldman Sachs, which, along with Beijing-based CDH Investments, has invested $100 million in Huang's company. "China will be a good market for the future," Deng told the Wall Street Journal. "But right now, the bigger market is in Europe. We're putting our attention on the Europe and U.S. market. But meanwhile we're developing efforts for the China market," which could eventually be bigger, he said. While the state seeks new technology, it also uses control of banking to feed cheap credit to industries it wants to foster. The government sets interest rates for China's bank depositors low relative to rates of growth and inflation. That means Chinese households, through the banks, effectively subsidize the state's industrial darlings. “But the price subsidy generated controversy among Chinese solar producers. They said that if the government set the price too high, there would be enough money only for a few solar companies out of the thousands here. Others raised nationalistic concerns, questioning why the government should subsidize a U.S. firm. An official in Ordos confirmed that the process to build the plant is now wide-open. Gao Gengui, energy section chief for the Ordos government's development commission, said the government is treating First Solar the same as competing Chinese solar companies, and he said First Solar should "go through the bidding process." The case has caused a split in the solar industry, with some U.S. companies saying imports of Chinese solar panels have lowered prices, helping consumers and promoting rapid growth of the industry. Solar and other renewable energy technology has emerged as an irritant in U.S.-Chinese trade. The two governments have pledged to co-operate in development but accuse each other of violating free-trade pledges by subsidizing their own manufacturers. Don’t be surprised if Chinese solar companies try to pursue a similar path, which could benefit American consumers of solar power if it helps propel the technology beyond its current niche status. Chinese solar panel makers have already begun moving operations to the United States to avoid trade restrictions. With the new case, filed at the Commerce Department, some industry executives expect the Chinese industry to increase its American expansion. That could help the Chinese companies avoid import restrictions and insulate them from currency fluctuations as China allows the renminbi to appreciate gradually against the dollar. Suntech Power of Wuxi, China, the world’s largest manufacturer of blue solar panels---the most commonly used type---has already moved some simple assembly tasks to the United States. Other big Chinese manufacturers like Yingli Green Energy and Trina are considering similar moves. A partial shift of Chinese production could help create some new and mostly blue-collar American jobs. But a broader move into the United States could turn Chinese solar panel manufacturers into even fiercer competitors with their American counterparts. The solar energy trade complaint “will only accelerate the setting up of solar module and solar cell manufacturing in the United States,” Ocean Yuan told the New York Times. Mr. Yuan is the president of Grape Solar, a company based in Eugene, Ore., that is a big importer of solar panels from China, Korea and Taiwan. Grape Solar has already been in discussions with big Chinese panel makers on ways to move more manufacturing to the United States. Mr. Yuan said that once the necessary construction permits were obtained, it took only three to six months to build a factory that did the final step of assembling solar cells into solar panels. It takes six months to a year to build a highly automated factory to make solar cells from solar wafers. Many American cities have already been seeking Chinese solar power factory investments, which could speed the permit approval process. Chinese state-owned banks have extended nearly $41 billion in loans and lines of credit to the country’s solar panel manufacturers, according to the trade case against them. Investing even a small part of that money in factories in the United States would sharply increase capacity. Suntech moved production of the last step in the manufacturing process from China to Goodyear, Ariz., last year. About 100 mostly blue-collar workers in Goodyear assemble panels that each have five or six dozen solar cells that were shipped in from China. The workers then add a glass cover, bolt on an aluminum frame, attach a junction box and package it for shipping. This process has already enabled Suntech to label the solar panels as “Made in U.S.A.” As a result, they now qualify for federal “Buy American” subsidies. The steep tariffs sought in the trade complaint could also cause China to retaliate. The country might, for example, shift more of its hefty annual purchases of solar panel manufacturing equipment to German suppliers instead of American ones. “It would be a travesty for the solar industry,” said Tom Zarrella, a former chief executive of GT Solar, a New Hampshire supplier of the manufacturing equipment. American companies like GT Solar ship a total of about $1 billion worth of products a year to China, while other American firms ship an additional $1 billion a year in raw materials to the Chinese solar companies. In the first eight months of the year, Chinese panel makers shipped $1.6 billion of products to the United States. The current betting by trade experts is that the American solar panel industry will win its case, which could lead to tariffs early in 2012, even if the proceedings take a year or so to play out. That is because the United States still classifies China as a nonmarket economy, which sets off special rules for the evaluation of antidumping and antisubsidy cases that heavily favor American companies. American companies have won almost all the antidumping and antisubsidy cases they have filed against Chinese companies for the last 20 years. The solar industry has clear differences from the auto industry, of course. The American solar power market totaled only $6 billion last year, with the industry employing no more than 100,000 people and possibly considerably fewer, depending on whose estimates one believes. In contrast, the United States’ auto industry in the ‘70s had revenue in the hundreds of billions and employed more than a million people. But while the solar industry is in its relative infancy---solar power now contributes about one-tenth of 1 percent of the United States’ electricity---it is growing fast. The new solar wattage installed in the United States has been growing 74 percent a year since 2008, according to GTM Research, a renewable energy market analysis firm in Boston. Companies that develop solar power projects in the United States would not welcome paying tariffs on panels that might exceed 100 percent of the wholesale price. Victory in the case could still buy the American industry time to reduce costs and improve their efficiency. That may be why shares of the biggest Chinese solar power companies, which trade in New York, fell 5 to 9 percent after the trade case was announced. But setting up solar panel factories is faster and simpler than building a car assembly plant, which could allow Chinese solar power manufacturers to respond quickly. To avoid punitive tariffs, Chinese companies would need to make solar cells in the United States and then assemble them into panels---steps that together represent only about half the cost of a solar panel. The other half of the cost consists of a series of initial steps that result in the production of a polysilicon wafer, which the Chinese industry would probably continue to find cheaper to do in China. The vote does not impose any penalties but says there is reason to believe that Chinese imports harm or threaten to harm the U.S. solar panel industry. China's Ministry of Commerce said in a statement that the decision was made without sufficient evidence showing the U.S. industry had been harmed and did not take into account Chinese companies' arguments or opposition from U.S. industries and other affected groups. "China is deeply concerned about the decision, which does not tally with facts and highlights the United States' strong tendency for trade protectionism," it said on its website. The statement said China hopes the U.S. will objectively analyze why some U.S. solar panel companies lack competitiveness. "The United States should avoid abusing trade remedies which will affect bilateral trade and mutually beneficial co-operation between China and U.S. enterprises in the new energy sector," it said.